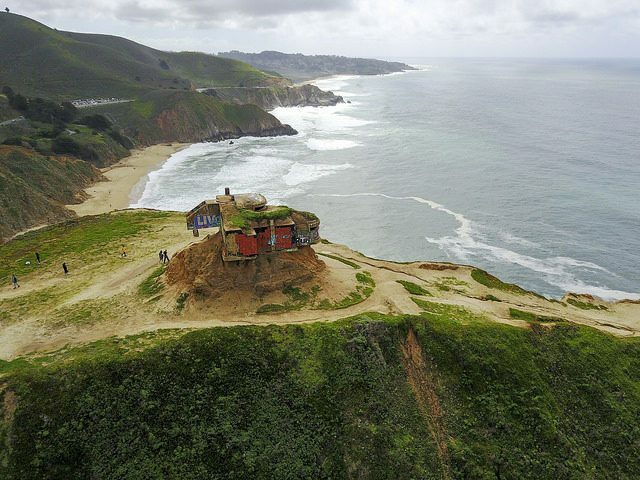 There is a rocky and very steep coastal rock formation just off Highway 1 between Montara and the Linda Mar District of Pacifica. It has been named the Devil’s Slide due to its dramatic and rather daunting appearance. 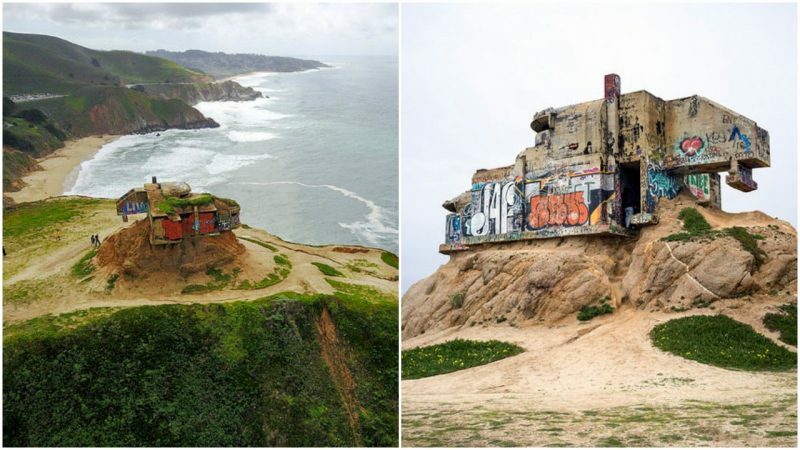 On top of the Devil’s Slide stands an abandoned World War II concrete and steel relic. It was a bunker that served as a triangulation and observation station. 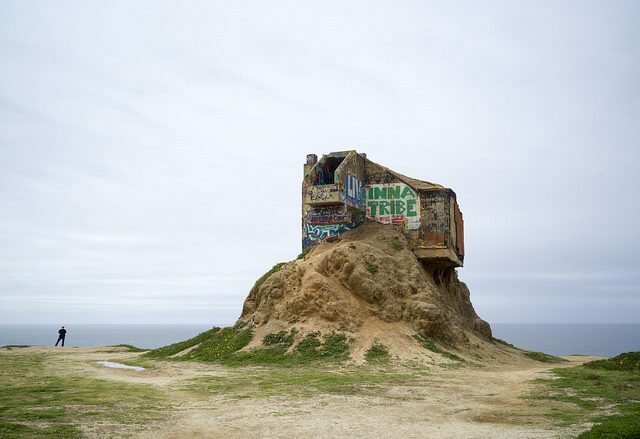 The lonely bunker atop the Devil’s Slide alongside five other “fire control stations” was part of the Little Devils Slide Military Reservation, a control and observation station built by the United States Army. The threat from Japanese naval attack on North America during the Second World War was more than real. And the San Francisco Bay area was a key priority for the U.S. military. Prior to developing radar and more advanced equipment for detecting and tracking, it all had to be done the old-fashioned way. Which meant relying only on what eyes can see. Soldiers were on a constant lookout on the horizon, using binoculars to spot and identify anything that moved in the water. Part two of their job was to calculate the coordinates and transfer them via radio to the massive guns and cannons in the Marin Headlands and at Fort Funston, so they could “greet” them properly. 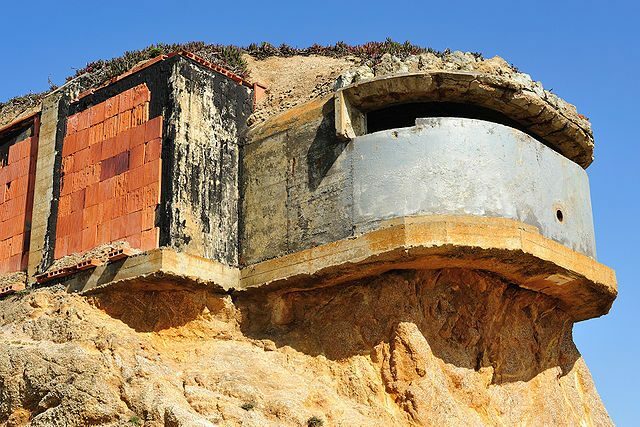 The remaining five military structures at the slide were three concrete and steel so-called “observation pill-boxes,” one more concrete earth bunker (along with the one at Devil’s Slide), and a big steel reinforced observation tower. 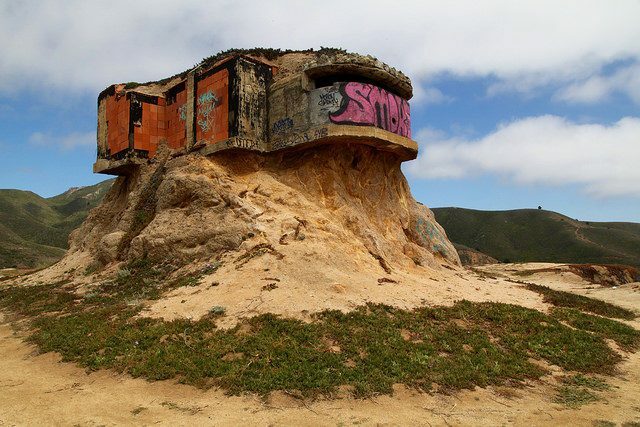 The pillboxes were mainly observational posts, but they could also provide some defense if needed; they were sometimes referred to “the hardened observation posts.” One of the bunkers was the main strategic point and served as a headquarter and command post to all the area. Apart from the bunkers and observation installations on the shores of the bay area, the U.S. military apparatus took actions of defense offshore. The Army released hundreds of water mines in the ocean waters outside of the bay, and a huge steel submarine net was placed across the inside of it. All the effort put into the defense of the bay area may not seem to matter much today, as we know that an attack from Japan was never issued on the San Francisco port. However, it served a great deal in raising the morale with the locals then, since many of them helped by volunteering in different ways to ensure the well-being and safety of the bay, their homes, and their country. The Devil’s Slide site was sold to a private investor back in 1983, rendered needless to the modern military defenses of the harbor. Most of the buildings have been disassembled, but the main structure remains in place. 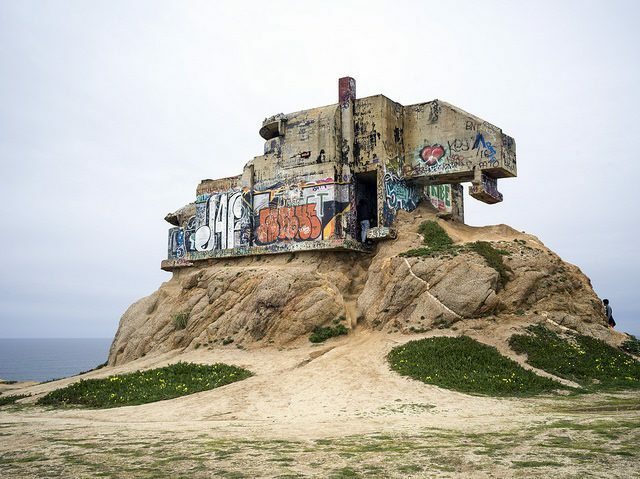 It’s covered with graffiti, and even though it’s on a private piece of land with restricted public access, many people still visit and admire it. The views from the trail leading to and from the old bunker on a clear day are striking. However, the weather is often foggy, which creates an eerie atmosphere. 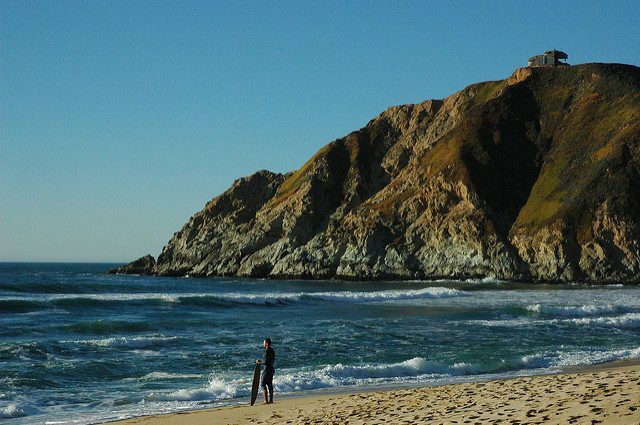 The Devil’s Slide location was used as a set in the Hollywood movie Portrait in Black, starring Lana Turner and Anthony Quinn. The scene that was filmed there was of two lovers who push a car off a cliff and into the ocean, with a dead man’s body inside. The State of California gave permission for the scene with one condition: the car must be afterwards removed from the water and taken to a junkyard.